Fox is obviously actively shifting in plain sight to an anti Trump machine. 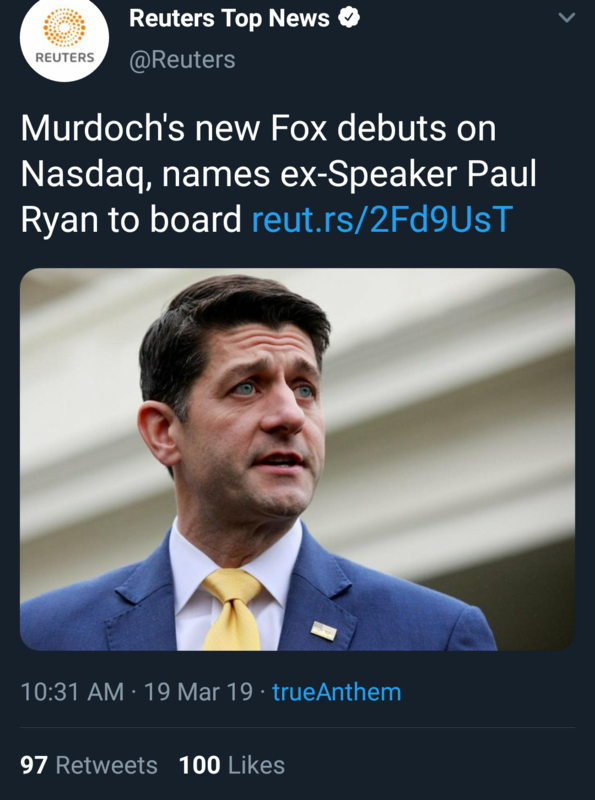 Paul Ryan on the board? There isn't a network left that even pretends to support Trump. That is odd. He's qualified for this because he's a rat? Hope Hicks is still there at Fox I believe, makes this move intriguing. Didn't someone here show that trump doesn't make most of his own tweets anyway. Yeah, there were tweets made while Trump was live on stage at a rally or something like that. The problem with the zero delta tweets is that they are always Q many seconds behind, never a few seconds before. The one that I remember that was supposed to be a big deal was 10 seconds off and Q used the internet lag excuse. An anon took them to task and posted his lag and it much lower, can't say for sure but I seem to recall something like 3 or 4 seconds. You would think that if they are in the same room with Trump, and the president is in on all this, Q would be able to tell the president to wait 10 or 15 seconds after Q posts to hit send so you could have at least 1 example of a zero delta where Q posted first. If there is one, I have not seen it. That is the one I linked and Q posted 10 seconds after. That is an area Anons pretty much ignored. So now we can add ambassadors to the hit list. DOJ, CF, C_A, Five Eyes, Unknowns, ChiFi and other double agents, traffickers, drug dealers(entire bush family) Ambassadors, All media. Folks be patient, this is a bigger mess then that time I tried to make a chocolate souffle. Yea, just a wee bit scary. Ya gotta be fairly insane to make stuff like this up. Truth is stranger than fiction. If the NZ shooter had a therapist it must have been a traveling mobile one given all those countries he visited over a, what 2 yr span. Maybe like in 'The Bourne Legacy (2012)' where they just had to check-in periodically. Blood check & meds refill.